Looking for a fast, easy, and unique approach to fundraising for your school, church, non-profit, or other group this year? 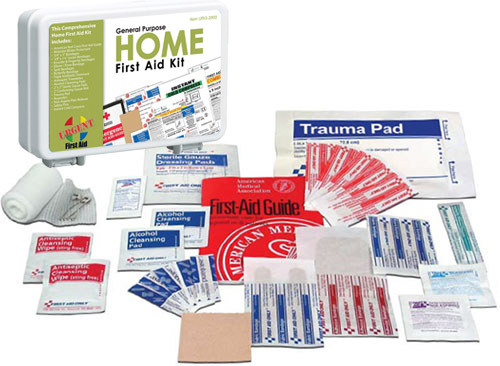 Our First Aid Kit Fundraiser is the solution for a fun, healthy, and safe fundraiser - this new idea for fundraising is sweeping the nation with popular response from PTAs, PTO's, Scouts, Schools, Churches, and more - See how easy it is to raise funds with this new alternative to the worn out and unwanted candy, gift wrap, magazines, and candles - download the free brochures and get your First Aid Fundraiser Starter kit TODAY. *Note: FREE SHIPPING ON ORDERS FOR 510+ KITS - In order to keep the price of these kits so very low, allowing you can make a great profit for your group, we cannot honor free shipping for orders under 510 kits. 3. AND GO GET 'EM! What an EASY Sale! Buy them for $5 ~ Sell them for $10 (or More!) Easy enough? 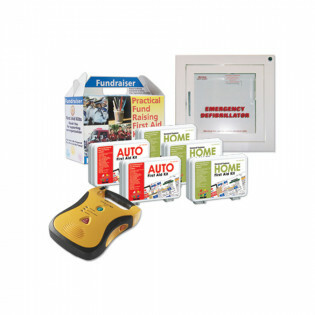 Pre-sell, sell at your fundraising event, or pre-order to sell door-to-door. After you have taken your orders or are ready pre-order, just fax or email in your order form, or return here to place your order online! This easy-to-implement fundraising program also offers colorful sales material and samples to train the participants and/or show to your buyers. This is an easy program even for first time fundraisers. 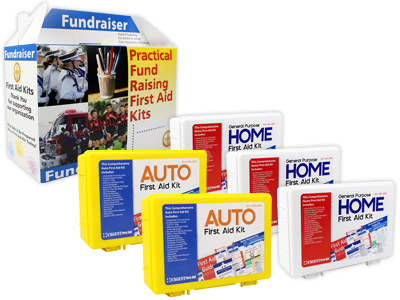 • 5 sample fundraiser first aid kits (mixed) in a Fundraiser carry box. (purchase below for just $25 including a great – and FREE - door-to-door carry tote!) *Limit 5 per customer – If you have an exception for this limit, please call us Toll Free. • Use these samples for training, and carry them along in the convenient carry box to show your buyers! • Some successful Fundraisers have purchased the kits in advance so they can sell them immediately at their event or door to door... others use their sales sheets to track orders and purchase with us after the close of their Fundraiser, to then distribute the kits to their buyers. GREAT WAY: Download the free brochures, type in your Organization's information & print out as many as you need, then go take orders! BETTER WAY: Download the free brochures, type in your Organization's information & print out as many as you need, ORDER A SAMPLE PACK BELOW TO TRAINER YOUR “Sellers” AND SHOW YOUR "Customers", then go take orders!